We’re excited to be Virtually Connecting from OLC Innovate in NOLA and to be part of the Virtual Lounge. If you’re interested in having conversations with some of the folks onsite, we have the following sessions planned. On Wednesday, April 5th, Lora Taub-Pervizpour and Patrice Prusko will be talking to us about the Solution Design Summit. They will be joined by onsite buddies Michael Berman and Sundi Richard and virtual buddy Wendy Taleo. On Wednesday, April 5th, we will explore the Innovation Lab with David Goodrich during a Game Jam session with John Stewart and Keegan Long-Wheeler. They will be joined by onsite buddies Andrea Rehn and Sundi Richard and virtual buddy Wendy Taleo. On Thursday, April 6th at 10:30am. Heather Castillo, Jill Leafstedt, and Kristi O’Neil-Gonzalez will talk to us about an online dance course they worked on. They will be joined by onsite buddy Sundi Richard and virtual buddy Kristen Eshelman. Also on Thursday, April 6th, Rolin Moe and Chris Gilliard will give us a tour of the Innovation Installation in it’s second year at OLC Innovate. He will be joined by onsite buddy Sundi Richard and virtual buddy Joe Murphy. On Thursday, April 6th, we will be talking to Breana Yaklin and Caroline White about their work involving students in the course design process. They will be joined by onsite buddy Sundi Richard and virtual buddy Kristen Eshelman. Our last session is on Friday, April 7th, talking with Robin Bartolleti about her work using design thinking for learning design. She will be joined by onsite buddy Sundi Richard and virtual Buddy Ken Bauer. If you’re interested in joining any of these sessions to participate in the conversation please fill out this form indicating which session(s). We’ll ask for your email address so we can send you a link to the session just before it goes live. Listed times are local of the conference site. If you would like to watch these sessions click play on the embedded videos above at the scheduled time, or any time afterwards (they are livestreamed and recorded). 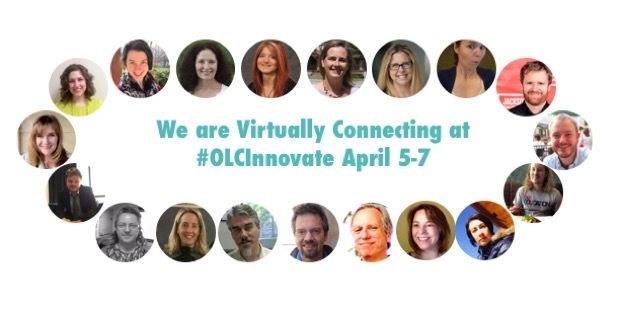 Thanks to OLC Innovate for providing complimentary registrations for Sundi Richard as an onsite buddy and Wendy Taleo for her “virtual press pass”. Also a shout out to Clark Shah-Nelson for helping organize sessions and inviting us to be a part of the Virtual Lounge.